Île aux Cerfs Island , known in English as the deer island is an island near the east coast of Mauritius in the Flacq district. This paradise island of Mauritius constitutes of around 100 hectares of land. Nowadays there are no more deers on the island, but you will find there some of the worlds beautiful beaches and as such it is one of the must place to visit and see in Mauritius. 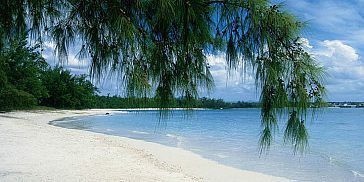 Ile Aux Cerfs is famous for its sandy beaches, beautiful lagoon and big selection of activities and facilities. In Ile Aux Cerfs you are sure to have a day of relaxation and fun on one of the picture-postcard beaches, and to enjoy a swim and snorkeling in the lagoon. Every day, tourists visit Ile Aux Cerfs and spend the whole day on the island and benefit from the range of facilities and activities offered on the island. During recent years Ile Aux Cerfs Island became one of the most popular tourist destination in Mauritius. Please note that we offer all our customers all type of Ile Aux Cerfs tours according to their preferences. 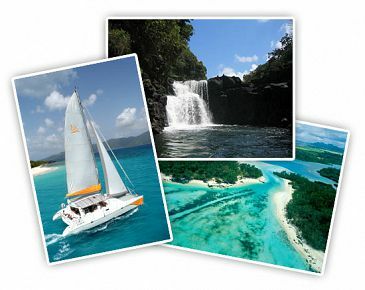 You can get to Ile Aux Cerfs from the mainland by speed boat, catamaran or even yacht. These are available at various points on the east coast of Mauritius. The Ile Aux Cerfs beaches offer several water sports activities, restaurants and also a five stars hotel with a golf course, all making this amazing paradise island the perfect setting for a relaxing day of sun worship while enjoying various water sports, beach activities and even golfing. On Ile Aux Cerfs you will find many restaurants that cater to almost every palate and you should definitely try some of the local cuisine. In addition, there is a big selection of water sports kiosks along certain parts of Ile Aux Cerfs beach including: water skiing, banana, glass bottom boats and more. Ile Aux Cerfs is a highly recommended location for snorkeling. The coral reef is beautiful and full of marine life, and together with the large black rocks that protrude into the water, it is an ideal place to snorkel and to enjoy the rich underwater world. The island also has a 18 holes golf course, so if you want to experience Mauritian golfing while seeing the breathtaking views of the lagoons and the clear Indian ocean water all around, this is definitely one of the best places to go to. When you visit Mauritius make sure to visit Ile Aux Cerfs – the paradise island of Mauritius. You will have an experience which you can share with your family and friends and cherish all your life. Go on an organized tour rather than going by yourself. Our recommendation is to take an organized tour to ile aux cerfs as the price of these tours is usually much cheaper than traveling by yourself and paying for the taxi/transport and speed boat trip. These travel packages are saving time and hassle as well as money, and they will allow you to relax and truly enjoy the beauty of Ile Aux Cerfs when knowing all arrangements are being taken care of. Also, almost all the ile aux cerfs tours include full lunch and drinks as part of the tour, making it a much cheaper alternative, and definitely offering good value for money. You should also consider when you travel by yourself, that the transportation is a hassle and is usually more expensive, and also your lunch expense will probably be much higher (expect to pay relatively high tourist prices for lunch). Day trip full of sun, drinks, delicious food and lots of fun and relaxation! 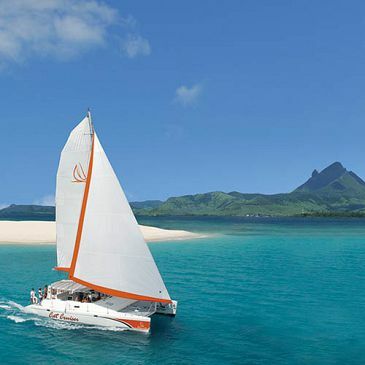 Treat yourself to a memorable day of exhilarating sail on a beautiful 45 foot luxury catamaran to Ile aux cerfs – this will definitely be one of the highlights of your holidays in Mauritius. This cruise takes you to the island of Ile aux Cerfs on a brand new catamaran specially designed for day charters. On board enjoy a top quality chef lunch, selection of alcoholic beverages (beer, rum, cocktails) and non-alcoholic drinks and more. 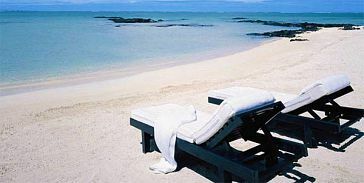 The catamaran cruise departs at 09:30 from the hotel’s Jetty located at Pointe Jerome on the south east of Mauritius. Expected arrival time back to the hotel is 16:30. This cruise is all about sailing through crystal clear waters whilst enjoying breathtaking sceneries and relaxing on the beautiful white sand bank of ile aux cerfs. Along the way at around 11:00, the catamaran makes a stop for you to enjoy snorkeling inside the islands largest lagoon allowing you to enjoy the underwater marine life and swim amongst superb corals and brightly colored tropical fish. 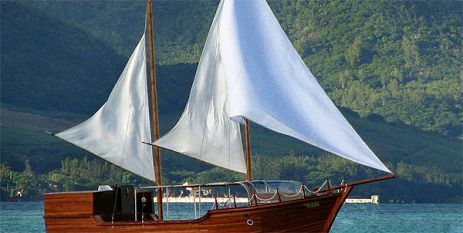 After lunch the catamaran will cruise into the canal between the Isle aux Cerfs and the world class sanctuary of Anahita before dropping you off on the famous white sand bank of Ile aux cerfs. On Ile aux Cerfs Island you are sure to have some relaxation and fun on one of the picture-perfect postcard beaches or enjoy a swim and/or snorkel inside the lagoon. You can also take advantage of the wide range of facilities on the island and the various water sports activities found there. After spending some time on Ile aux Cerfs, you will re-embark on the catamaran and sail back to the Hotel’s jetty. Once on board tea and coffee is served as well as slices of cake, not to forget the open bar that remains open. The crew members will make sure to make your time more enjoyable, and they will be happy to tell you about local tales, jokes, and play local Mauritian sega music which will lift the spirits of all the people on board. Also there is a sound system to play various selection of cd’s. All along the day from the moment you board the catamaran you can enjoy the open bar service. About the catamaran: it is a brand new 45 feet catamaran offering comfort and space. A huge shaded cockpit, with seating for each passenger and large comfortable trampolines for sunbathing and relaxing. Also for the convenience of the passengers this luxury catamaran includes two queen size cabins, hot-cold showers, and toilets. Mauritius Attractions also offers a full day catamaran cruise to Ile Aux Cerfs which departs from the village of Trou D’Eau Douce on the central east coast of Mauritius. This cruise includes: visit to Grand River Waterfalls, BBQ lunch, and unlimited supply of soft and alcoholic drinks. 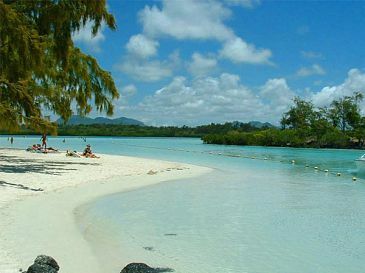 This Ile aux Cerfs Tour is the ideal choice for the budget traveler who is looking to visit this paradise Island. Enjoy a day full of fun and relaxation on a true paradise island! You will get to spend a full day at Ile aux Cerfs, having a delicious lunch at the Masala Indian restaurant situated along the main beach of Ile aux Cerfs and operated by the Le Touessrok hotel (5 stars deluxe). The Ile aux Cerfs day tour starts with a boat transfer to Ile aux Cerfs Island. The boat transfer is done in the comfortable spacious motor boat, and the boat trip takes about 15 minutes. The boat transfers to Ile aux Cerfs are provided every 20 minutes, accordingly you benefit maximum flexibility on the exact time you can start / end the tour. You will have free time to spend on the beach, going for a stroll, swimming in the lagoon, snorkeling or just relaxation and tanning. At around noon time a delicious Indian menu meal is served. You can choose when to have the lunch which is offered anytime between 12:00 – 14:00. Paneer Makhan Masala, Tadka Dal, Tandoori Naan, Mint & Coriander Pulau, Cucumber & Onion Raitha, Pickle & Pappad, Gulab Jamun as dessert. You will get to spend a full day at Ile aux Cerfs, having a delicious 3 course Set menu or BBQ buffet for lunch at the Sands Grill situated along the main beach of Ile aux Cerfs. 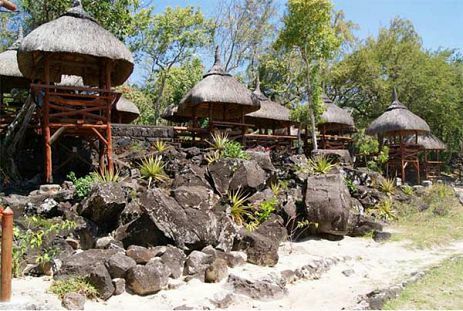 This trip was chosen by “Mauritius Travel Magazine” has the “BEST VALUE FOR MONEY TRIP TO ILE AUX CERFS”. This Ile aux Cerfs tour offers a day of pure relaxation as you soak up the sun on the dazzling white sand and swim in the warm turquoise waters that fringe the beaches. You will get to stay on one of the picture-postcard beaches of Ile aux Cerfs and enjoy swimming and snorkelling in the beautiful lagoon surrounding the Island. The Ile aux Cerfs day tour starts with a boat transfer to Ile aux Cerfs Island. The boat transfer is done in the comfortable spacious motor boat, and the trip takes about 15 minutes. As you approach the island by boat, you will see the swaying palm trees and the pure white beaches framed by the vivid turquoise waters. Once you reach Ile aux Cerfs you will be guided to the famous Ile aux Cerfs Sands Bar where you will start your Ile aux Cerfs experience with a refreshing fruit cocktail. Then after you will have free time to spend on the beach, going for a stroll, swimming in the lagoon or just relaxation at the Sand’s bar or on the beach. For your convenience, as part of the package, you will have a Sun Mattress for the day to lie down or for tanning just beside the beautiful beach. At around noon time a delicious 3 course meal OR BBQ Lunch buffet is served. You can choose when to have the lunch (offered any time between 11:00 – 15:00) at the Sands Grill. Should you be interested, you can also book the Drinks package for a supplement. Sands Bar- Offering a selection of drinks, light lunch dishes, pizzas and snacks. Main course: Chargrill fresh fish, Chargrill ginger chicken, Chargrill mini beef steak, Chargrill lamb sausage, Chicken curry, Tappan mix vegetable, Steam garlic butter potato, Spanish tomato rice and Stir fried egg noodle. Menu Vegetarian – Vegetable menu is available upon request. In case you would like a vegetarian meal, you are kindly please requested to inform us during the booking process. Parasailing - It is possible to organize for you to do parasailing during your time on Ile aux Cerfs. The parasailing offers you a breathtaking bird's eye view of Ile aux Cerfs Island, its beautiful beaches and the beautiful east coast lagoon, making it a truly memorable and worthwhile experience. You can go for the parasailing as individual or as a pair. 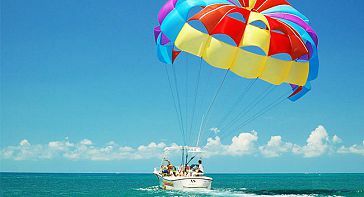 The parasailing is offered for an additional fee of 24 Euro/person. Full day (09:15 – 16:15) of full of sun, drinks, delicious food and a lot of fun and relaxation on the East Coast of Mauritius (departure from from Trou D’Eau Douce). The boat (34-foot) is of unique design, made as a replica of a real pirate boat with two masts and five sails of wooden brown varnished, takes you as a passenger back in time to the old days of the pirates. The theme of this trip is of a pirate adventure with a surprising pirate show. 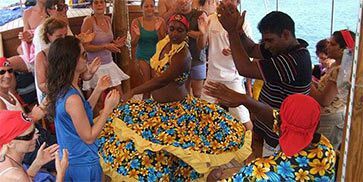 As part of this cruise, you will get to experience a sailing cruise on the pirate boat to the beautiful Ile aux cerfs while enjoying exciting pirate show, live music, and dance show. Also BBQ lunch and drinks are included. You will also get to enjoy cruise along the South East Coast of Mauritius and a visit to the South East waterfalls on the Grand River. The Pirate cruise starts at 09:15 from the village of Trou d’Eau Douce, situated on the East Coast) when you board on the ship. Then sailing along the shoreline the boat will head to the Grand River falls for a visit to the falls. After the visit to the waterfalls the boat will sail along the lagoon, cruising in its crystal clear water. It will then drop anchor in the lagoon for you to have a snorkeling or swimming break. At around 12:30, it is midday and the pirates are hungry and it is time for a pirate’s lunch which will be served on board the boat. The lunch includes: salads, potatoes, BBQ chicken, Fish and tropical fruits dessert. Also, you will enjoy a selection of drinks including: Water, Coke, beer, local rum and white wine. The atmosphere on the boat is very friendly, with music and Sega dancing performed by the crew which keeps the atmosphere lively and exciting throughout the journey. At around 12:45, the boat will sail to the paradise island of Ile aux Cerfs . On Ile aux Cerfs Island you are sure to have relaxation and fun on one of the picture-postcard beaches or enjoy a swim and snorkel in the lagoon. You can also take advantage of the wide range of facilities on the island and the various water sports activities such as: Parasailing, Banana Boat, Fly Fish and many more. At around 15:00, you will leave Ile aux cerfs Island, heading back to east shore. Expected arrival time back to Trou D’Eau Douce is 16:15. The Boat - is a replica of a real pirate boat, 34ft in Length, and 11 ft in width, with two masts and five sails of wooden brown varnished. The boat capacity is 30 passengers. The boat has tarpaulin to protect against rain, and toilets on board. Enjoy a private trip in a taxi to Ile Aux Cerfs island, including pick up and drop of to your hote / place of accommodation. The taxi will take you to the east coast of Mauritius, to the area of Trou d'Eau Douce, from there you will be traveling by motor boat you will arrive to Ile Aux Cerfs. You can enjoy a full or half day of relaxation and fun on Ile Aux Cerfs before heading back by speed boat to the mainland and heading back to your hotel.